From the very start of the company, quality has been very important to us. Our design and manufacturing processes are carefully managed and we have a flexible and fully traceable control system in place that covers all aspects. As the company grew taking on more staff and more complex projects, the need to have a formal Quality Management System (QMS) became apparent and this was implemented in 2011. This QMS system has been gradually improved since then to better work for the business and to add value for us and our customers. 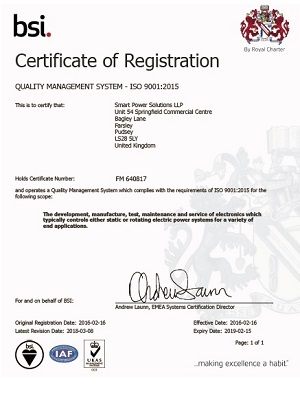 In Q3 2015 we engaged British Standards Institute (BSI) to carry out a “pre-stage audit” of our QMS to ISO9001:2008. This having been successful we pushed straight through to employing BSI to carry out external auditing. The company achieved certification in February 2016. Given our company name, you won’t be surprised that software is involved in much of what we do. This is mainly embedded code in microcontrollers / DSPs but also involves other platforms. We have a documented software quality policy which governs all aspects of development including how we manage tool versions, requirements capture and verification / validation. The software coding structure and rules are based on ‘MISRA C : 2012′ with very few deviations. Whilst MISRA C was originally developed by the automotive industry, it has now been adopted by many other industries as more and more applications contain software and have an aspect of safety in them. We are currently assessing several functional safety standards and trialling code checking and testing tools. We have now had our readiness review for ISO9001:2015 with our external auditor from BSI. The outcome of this was very favourable with just a few areas requiring some improvement. This has now been carried out and we are looking forward to our first external audit which is booked for the 11th January 2018.